For the last couple of years my races were run in marathon series, 3 or 4 marathons in a row in the same number of days. While this is a crazy and seemingly almost super human task I did it to save money and to be able to do a lot of states in a very short time. Lack of cash pushes one to do things most people can’t believe to be possible. Since I only have a few states left I have decided to only do single marathons so that I can better enjoy the area I’m running in until I finish my 50 marathons in 50 states goal. 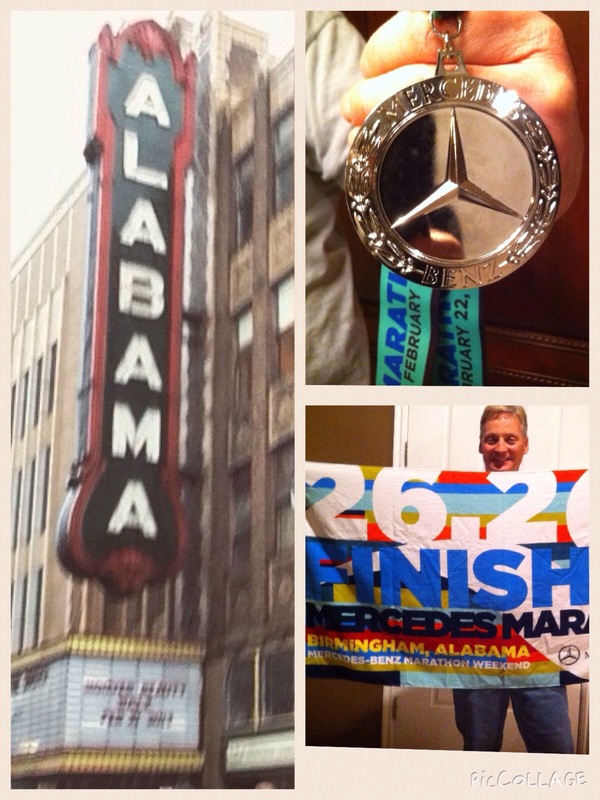 The Mercedes Marathon in Birmingham Alabama was state #37. I’ve never been to Birmingham but I did know that back in the 60’s Birmingham was the center of the Human Rights Movement. I imagined an old city that hadn’t changed in the last 50 years. Wow, was I wrong. Surprise and excitement was what I found. It’s a beautiful and very modern city. The expo was in a huge sports center and since Mercedes Benz put this marathon on the expo center was filled with expensive Mercedes Benz cars! I couldn’t resist crawling into one and imagining it was my own beautiful baby! Ah, you just can’t get enough of that new car smell! I asked one of the directors if they were going to give a car or two away to the different winners and if they had a ‘challenged athlete’ category. Since I was the only amputee running in the whole race I figured this would all but guarantee me a new Mercedes Benz for the garage! 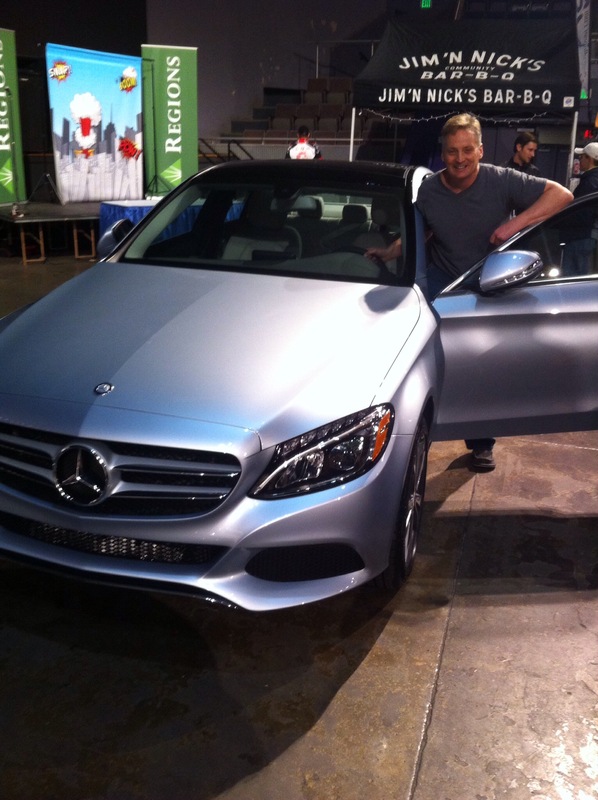 In the immortal words of Janice Joplin, “All my friends drive Porsches, I must make amends, so Lord won’t you buy me a Mercedes Benz”. I was told that at one time they did give away a car but not anymore. And he was not aware of a special challenged athlete category. Hey, you never know unless you ask! After picking up my packet at the expo I needed to find a hotel and some food. 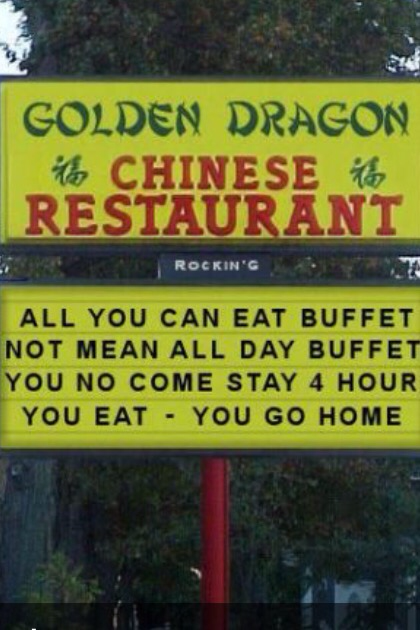 The hotel wasn’t too far away and very close by I found a nice looking Chinese Buffet. As I walked up to front door entrance there was a hand written sign taped to the door. The sign read “You may get all you want but you must eat all you get”. This made me think twice and I almost did not go inside but it was getting late and I didn’t have time to restaurant hunt anymore so in I went. The Chinese man at the cashier station didn’t look up once from his newspaper. He just pointed over to the tables and food buffet and grunted at me something like, “Go, Sit, Eat”. Well, I am no stranger to helping myself to food so off I went. There were more of those hand written signs taped everywhere. Signs like… “You get too much we charge you double”. This was great! Dinner and entertainment all in one place! I made sure to never take too much and to clean my plate completely. It made no difference to the Chinese man at the cashier’s station. He took my money and never smiled or said the customary, “Thank you sir and please come again”. He just picked up his Chinese newspaper and sat back down. It was so nice to run a totally organized and professionally setup marathon. The start of the race was in the street right out the front door of the expo building. There was plenty of parking and no need to be bused in or search for an hour for the starting line. There was plenty of food and drink and easy to read pacer signs all along the corals. Eric, instagram friend, now real life friend. The greatest part of any marathon has to be the energy! You could feel it everywhere the morning of this race. Music was playing and people laughing and talking and sharing stories. I found the 5 hour pacers and as I was introducing myself and getting to know the other athletes I’d be running with one of the two pacers says to me, ”Hey I know you we’re friends on Instagram.” Sure enough I recognized him too. How cool, I’d be paced by an Instagram friend. If I ever needed to hide from the mob I would have to move to the Moon just to be sure I didn’t run into someone I know.
. —–Warning, the next few lines describe graphic porta potty usage—–Read at your own risk—— As I head to the water tables I grab a cup of water and a cup of power aid and then enter the potty. Simultaneously as I sit on the seat and remove my running leg. I reach into my Bat Utility Belt, well the pockets of my running shorts, and smear Bio-Freeze and Pain-No-More on my stump. Then I retrieve several Tylenol tablets and down them with the help of the water. I slide my liner back on along with my running blade. Once all business is finished I exit the potty. 30 seconds flat! Superman would be proud. Sadly I never caught back up with my 5:00 hour pacers. I finished the race with a time 5 hours 23 minutes. The Bar-B-Q lunch and live band after the race was great. I enjoyed my lunch with the race director and her husband. After getting back to my car I checked my phone and saw that someone from my work had tried to call me. I spent the next hour helping a client with computer issues. Even though it was a Sunday I still get after hour calls. I work in IT. I’m the guy you call when you enter your login wrong too many times or can’t get a printer to work etc. 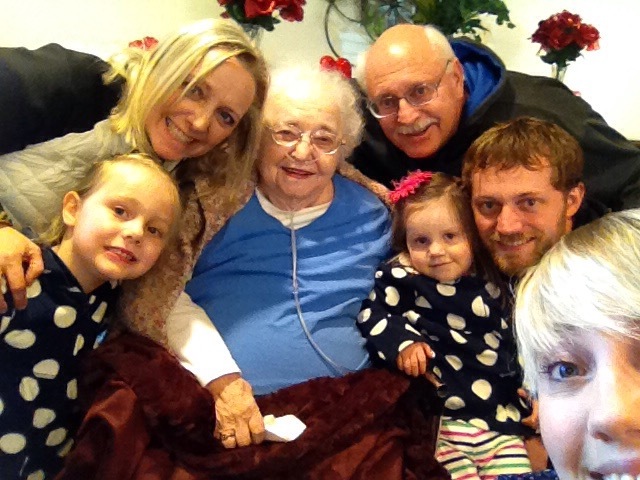 Later when I got back to Salt Lake I was shocked to find out I was let go in a kind of forced retirement from my job of 28 ½ years because I didn’t answer my phone in a timely manner. In my defense, I had arranged to have a co worker, “he whose name shall not be spoken” to take my “on call”. It was kind of a hatchet job, the day before the race, he informed me that he had decided to take a last minute road trip and I would have to take my own calls. I was forced to make a tough choice, complete my marathon plans gambling that I might get a call during the race OR cancel my trip, lose my race fees and airfare. This was a choice that should not have had to be made in a company that works together as a team but this was the company culture of late. Honestly it was not that big of a surprise. I have watched many fellow employees get pushed out over the past couple of years because they made more money than their newly hired bosses. I was lucky to have dodged the bullet this long. Ironically I work at a large mental health facility. 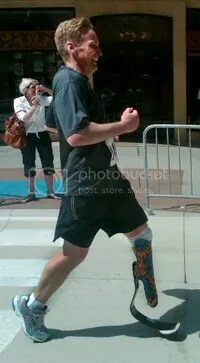 I am a one legged marathon runner. I run to inspire others and do motivational speaking. You’d think a mental health facility would love to support an employee with that kind of goal and ambition. 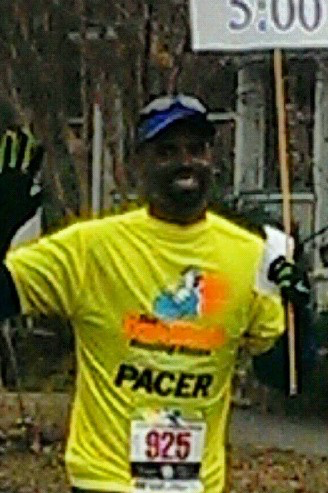 I will keep running until I finish my goal and continue to inspire and speak to those who need help and a role model. I have met all kinds of wonderful people running marathons but I guess it’s inevitable I will meet not so nice people as well. Da Haters gonna Hate. I can’t let them get to me and bring me down. Meanwhile back at home my family cheers in on. 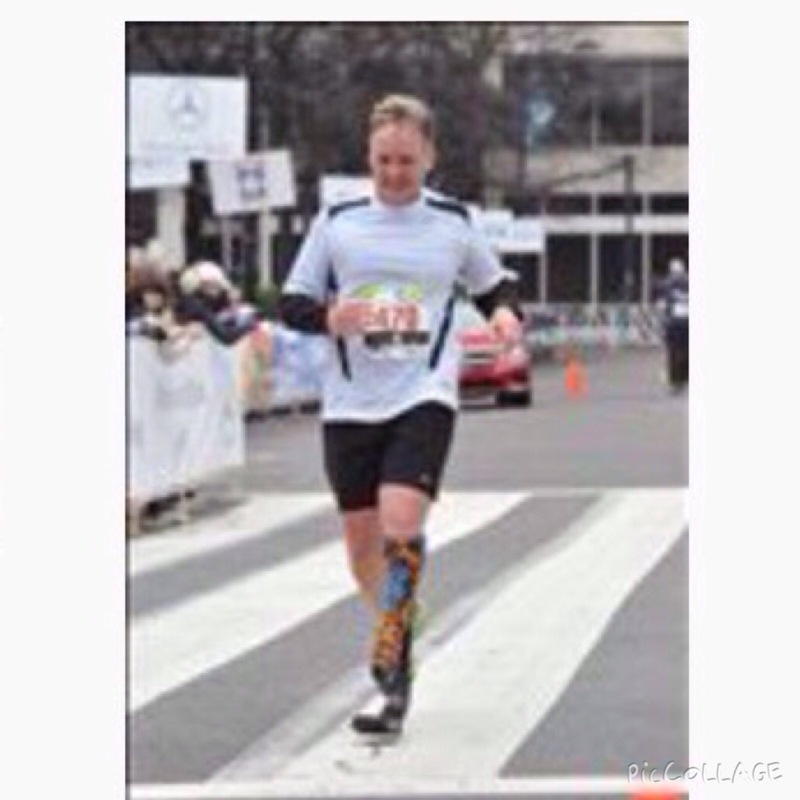 Posted in Adapative Athlete, Alabama, MarathonsTagged 50 marathons 50 states, 50 states 50 marathons 1 leg, 50 states club, adaptive athletes, adaptive runners, amputee, amputee at mercedes marathon, amputee marathon runner, burmingham marathon, challenged athlete foundation, losing my job because of marathon, mercedes marthon, team CAFBookmark the permalink.